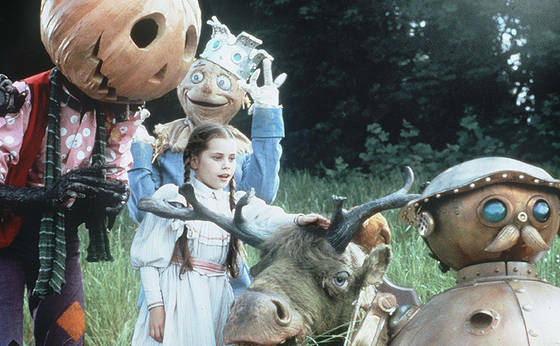 If you are between the ages of 25 and 32, you should know about Return to Oz. It’s a 1985 sequel to the Wizard of Oz. Well, I mean, it involves similar characters, but it’s not exactly a sequel. In fact, it’s more like the original book series by L. Frank Baum—just as creepy, and no one ever breaks into song. It takes place six months after Dorothy has returned from Oz, and everyone thinks she’s nuts. Yellow brick road? Scarecrows that talk? A woman with GREEN SKIN? Come on, Dorothy, snap out of it. Her aunt and uncle decide it’s time for her to seek help, so they take her to a creepy med clinic to get shock treatment. (No kidding. I couldn’t make this stuff up.) Anyway, she escapes this creepy place and magically, ends up back in Oz. But it’s not the Oz she remembers. Something is wrong. The Emerald City has been laid to waste. All Dorothy’s friends are missing, and there’s talk of some evil dude called The Gnome King. Being who she is, Ms. Dorothy must, of course, figure things out, save Oz, and save herself. The plot line in itself doesn’t sound too creepy—beyond the shock treatments. And it’s not the plot that makes this movie so screwed up and NOT child friendly. Instead, it is the side characters. 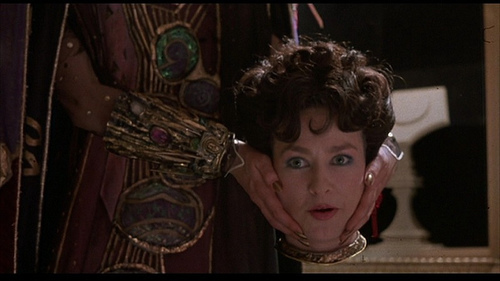 For instance, there’s Queen Mombi. She steals the heads of pretty, young women; keeps them in glass cases; and wears them in place of her own head. Example two would be the Wheelers. I just saw Legion, and I wondered what it was about the ice cream man with the disproportionately long arms and legs that freaked me out so much. Then, I watched Return to Oz, and I remembered—the Legion character made me flash back on the Return to Oz Wheelers from my childhood—psychotic creatures with wheels for hands and feet, who hunt Dorothy through the dilapidated Emerald City. Add to all this Fairuza Balk—yeah, that creepy chick from The Craft—because she plays Dorothy! ACK! Am I bashing this film? Hell no. I love this movie! Even as an adult, it still makes me feel like going “oogy-boogy” and covering my eyes. I am just surprised when I look back and consider the movies I got away with watching as a little kid, just because they were dubbed “Family” in the movie store. Movies like The Never-ending Story, The Dark Crystal, and The Labyrinth (I mean, David Bowie’s spandex-clad package alone should have been X-rated). I’ve watched each of these films as an adult, and in certain scenes, I just have to gawk because I can’t believe kids’ movies were so cool when I was young. Today, it seems like kids’ movies have to be uber-friendly. They have to be happy and cheerful and ick-ick-ick. How lucky we are, 25 to 32 year-old folk, for the way we were raised—with no cell phones, no internet, and plenty of politically incorrect films about shock treatments and Wheelers! Next Post Since When Is 28 Old? I’m so with you on this movie. It’s crazy creepy, especially Mombi and the wheelers. My siblings and I watched this and The Labyrinth as kids many times before my parents finally saw them with us and freaked out. They couldn’t believe they had been labeled “kids” movies and we weren’t allowed to watch them anymore. I’ve rewatched both as an adult and they really are kinda disturbing. HAHAHA … I don’t think my parents knew how creepy this stuff was until I told them as an adult. I’m thankful they didn’t catch on, though 🙂 Because I love these movies! Ohhh, you are sooo right! So many good children’s movies came out when we were kids, and so many of the children’s movies today seem so generic and vapid. I wonder why. But perhaps kids today luck out anyway–look at all the masses of fab children’s books that are now being written! I think they’re generic and vapid because movie makers don’t want to offend anyone. We’re all too damn PC, and it sometimes ruins good film making. But you’re right–there are tons of good kids’ books! Did any of you guys watch Faerie Tale Theater when you were young? We watched it all the time. Every episode had a different cast (usually really famous people like Robin Williams, Mick Jagger, and Jeff Bridges). I rewatched some of the episodes recently through Netflix and was surprised by how funny it is. Whoa! Cool! No, I never saw these. How fun. Will definitely check ’em out! This actually sounds like a pretty good movie — at least the plot sounds interesting. I’m ashamed to say I’ve never seen it. I’ve never thought much of the “The Wonderful Wizard of Oz.” (Sorry, I don’t know how to use italics.) Far superior children’s novels — such as “The Wind in the Willows” and “Peter Pan” — would be published a decade after Oz. However, if the theatre happens to strike your fancy, Gammage is hosting “Wicked” this February through March. A friend of mine, who attended back in 2009 when it was here, has said it’s a must see. It centers around the history of how The Wicked Witch of the West and Glinda the Good become, well, who we know they are. Sounds interesting. It’s trippy, man. Trippy. You gotta see it, though. I’m an “Alice in Wonderland” fan myself. I haven’t seen the musical “Wicked” yet. HOWEVER, I read the book “Wicked,” and you must read that book. It’s hilarious. It’s by Gregory Maguire, and he is the king of turning fairy tales into allegories on society. Check him out! I LOVE Alice in Wonderland and Through the Looking-Glass!! Now that’s literature! As a Philosophy minor, I LOVE the Logic spread throughout. My favorite poem is The Hunting of the Snark! Gotta love Lewis Carroll! Thanks for the recommendation! The musical is some time hence, so I believe I will read the book then see the musical. It will make for a better viewing. Thanks! You’ve GOT to make it down to Harold’s in Cave Creek, if you haven’t already! Steelers paradise!